To make the best use of our Supplies & Creativity we could all use some suggestions for Scrapbook Room Layouts. Whether we are fortunate enough to have an entire room devoted to our Scrapbook craft, or just a corner or closet, organization and storage of our supplies is the best way to use what we have efficiently. That efficiency comes not only with using what you have purchased, finding it when you know you have it, seeing it when you can't remember if you have it, and saving time looking for it because you don't really have a storage place. Proper Organization brings efficiency in several areas, financial, creative and time wise. Room Design Scrapbook Advice: Effective Room Design needs to take into consideration such things as colors, lighting, open spaces, floor covering and furniture that is compatible with the room size and floor covering. Don't forget you need to allow separate spaces for your tools like computer, printer, dies and die-cut equipment, punches, scissors, stamps, inks and templates. And of course your supplies like adhesives and glues, paper, fibers & ribbons, brads, eyelets, decorative tapes, stickers and pens. And don't forget storage for photos in various formats, as well those on CD's, books, and technique documentation. I purchased this book several years ago just after I moved to help me with my craft room and I have referred back to it many times during the process and since then. 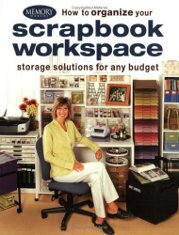 Scrapbook Workspace, Storage Solutions for any Budget from Memory Makers shows all sorts of examples from entire craft rooms to recovering space from other rooms. 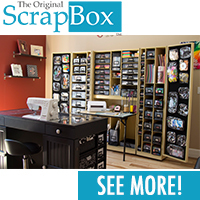 What better way to get organized in your scrappin' area than to get ideas for your Scrapbook Rooms and Scrapbook Storage from those that have come before. Photos of Scrapbook Room Layouts can help to move you on to your own designs or copies of others. Once you are organized, you will be able to be more creative and produce those beautiful layouts faster. This new book, just out November 2010, is the latest on getting your Scrapbooking Rooms Designed and Organized. 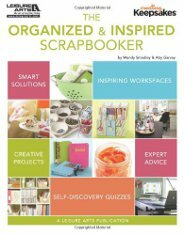 The Organized and Inspired Scrapbooker by Wendy Smedley and Aby Garvey will be available through Amazon.com on November 1, 2010. Pre-Order below at a discount today. 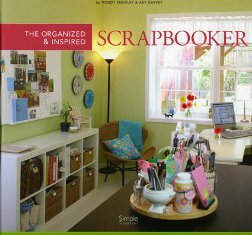 Another book also called Organized and Inspired Scrapbooker also by Wendy Smedley and Aby Garvey was published in 2007. Other books are available to help you create and organize your Scrapbook Room Layout, so take a look at some of what's available in our store below to get you started on a wonderful journey of creating you special room, corner or closet for your Scrapbooking and Papercrafting. many of which I use personally. off the total shipping price.